I believe most people in the Alzheimer's community will agree that Alzheimer's prevention is a good idea. For me, this means eating things that lower cholesterol, keep my heart healthy, and in general help my body ward off heart disease, cancer and dementia. I now realize you need to have a good awareness of all body parts, especially your vital organs. And, the brain. The interesting thing to me is that eating healthy is easy once you start focusing on the long term benefits. When Dotty went to Heaven she was almost 96 years old. This leads me to believe I will live to be 120 years old.. So my life is not even half over. If I make it to 100, I assure you my blogging will be packed with humor. When your are 100 you can say anything you want and never get in trouble -- right? Imagine the knowledge base of the Alzheimer's Reading Room will have over 50,000 articles by the time I reach 100 years old. I will have read every one of them. I hope this makes me smarter and not confused. Here are some good off the run eating ideas that might help prevent or delay the onset of Alzheimer's. 1. Cinnamon: May help control blood sugar and cholesterol. How to eat: Sprinkle on coffee or oatmeal. Cinnamon is my personal favorite. I start the day off with cinnamon in my coffee. Then I start blogging if mom doesn't wake up, well I don't have to worry about that anymore. There are a lot of ongoing clinical trials with cinnamon. 2. 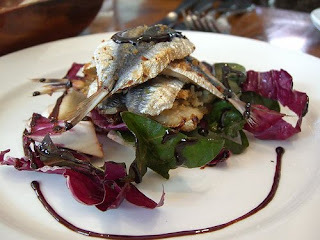 Sardines: They are high in omega-3’s, contain virtually no mercury and are loaded with calcium. They also contain iron, magnesium, phosphorus, potassium, zinc, copper and manganese as well as a full complement of B vitamins. How to eat: Choose sardines packed in olive or sardine oil. Eat plain, in a salad, or on toast. The big bang just shoot them in your mouth. Dotty got a really funny look on her face when I pulled out the sardines. 3. Curcumin: A yellow substance found in the spice Turmeric, has antioxidant, non-steroidal anti-inflammatory (NSAID), and cholesterol-lowering properties, all of which make it a good candidate in the prevention and treatment of Alzheiemr's disease. Dr. Oz suggests two servings a week. How to eat: Mix with scrambled eggs or in any vegetable dish. Mellow yellow? This is new to us, even though I had read the research I jumped on board after Dr Oz recommended it. I dig Dr. Oz. On going clinical trials on curcumin out the yin yang. 4. Canned pumpkin: A low-calorie vegetable that is high in fiber and immune-stimulating vitamin A. Canned pumpkin fills you up on very few calories. How to eat: Mix with a little butter, cinnamon and nutmeg. Kinda like a non pie pumpkin pie. Have to laugh at myself here. For some reason I am unable to perfect the making of a pumpkin pie. The pumpkin pies at the Boys are very tasty. Pumpkin doesn't really go well with pizza. I make excellent homemade pizza. 5. Beets: Think of beets as red spinach because they are a rich source of folate as well as natural red pigments that may be cancer fighters. How to eat: Fresh, raw and grated to make a salad. Heating decreases the antioxidant power. I put this one last for a reason, I don't eat beets period. Mom digs them. Spinach? Can't get enough of it. Lightly cooked, raw, yeah man. Kale chips are also excellent. Did I ever tell you that Dotty came in second nationally in a recipes contest. Her recipe and picture are in a book that you can buy. Feel free to use the comments box below to add your two cents. This was not intended to be a comprehensive list. I do recommended that you eat all of these a couple of times a week. Can't hurt and might just help your brain. Do they help? I believe they do. They also give me a nice positive attitude while I am eating them. Positive attitude is also a good thing and just might help ward off Alzheimer's disease. They also make me feel healthier.